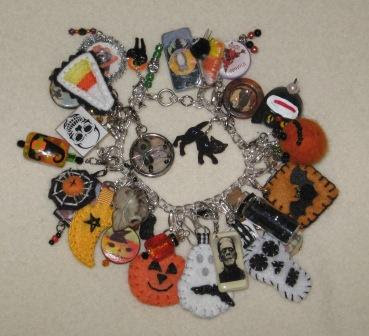 Here is the bracelet that I have made after getting my charms back from swaps. 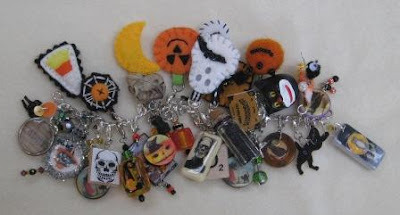 I was in two charm swaps, The Halloween Fiber Charm Swap and the Vintage Halloween Charm Swap. I could not use all the charms. Some were a little larger than I wanted or to fragile. If you made one and do not see your, please know I have plans for it. I am hoping to make a mini book of Halloween and plan to use some in my book and book spin. Happy Halloween. Wow!! why why why didn't I join the Halloween swaps??? Fantastic bracelet Cathy!